Good sturdy portable, its very capable. Surprisingly good SSB reception and sound. Its better than the more well known DX-440 in this regard. The DX-400 was only on the market on for a year and-a-half or so before being replaced by the DX-440. 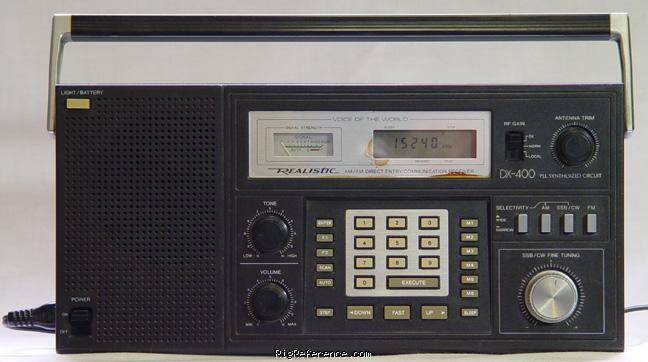 This is the superior radio, I've owned both, however it does not have a tuning knob. Keypad only tuning. does pretty well for an old receiver.. I like the antenna tuning feature... Seems fairly sensitive and I've heard radio New Zealand here on the East Coast us. Estimating the value of a rig can be challenging. We collect prices paid by real hams over the years to help you estimate the current value of the RadioShack / Realistic DX-400. Just bought or sold this model? Let us know what you traded it for and help other ham operators!